Ateliers de la Rive, a company based on the outskirts of St Etienne, France, started making tubes in 1931. 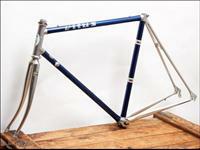 In the early post WW2 years their premium tubing was called Rubis, and widely used by French quality frame builders. Around this time Urago, in Nice, started using DURIFORT - the tubing maker's base set of plain gauge tubing for their "Debutante" model, and "Vitus" a lighter double-buted set, for their better frames, alongside Reynolds 531DB. Durifort continued as a set well into the 1970s by which time Ateliers de la Rive had introduced Vitus 171, a series of double-butted tubes in chrome-molybdenum steel, with wall thickness generally of 1.00 / 0.7mm. This was a quality tubing subjected to special drawing treatment to improve the structure of the steel and to reduce possibilities of fatigue cracks. Companies such as Peugeot used huge quantities of this tubing. Later in the 70s/early 80s, the company introduced alongside Vitus 172 - slightly lighter than 171 - an extra-light series called Super Vitus 971. This used the same type of steel but was drawn into finer tubes with 0.9/0.6mm gauge walls. The steel type was called XC 35. The base set at this time became known as Durifort-Rubis 888.Not much later Ateliers revised its range to include Vitus 888, at 2030 gms, a plain gauge set for touring frames, Vitus 181 a D/B set weighing 1790gms for racing., Super Vitus 983, at 1624gms, a "Course Professionel" set and Super Vitus 980, at 1507gms a "Course Professionel" Serie Extra Legere set. The SV980 also appeared as "Profil Arcor" an "aero" shaped set weighing in at 1615gms, and the 888 series figured also as "Vitus Profil" - a P/G aero set at 2030gms. Curiously Ateliers de la Rive never included the steering column and head tube in these weights. The "buzz on the block" at the time was that the SV980 set underwent some heat-treatment. The tube sets were delivered with instructions about how to braze these tubes and how to ensure that they did not suffer from "cold-shock" which could make them brittle. In the later 1980s and early 90s Ateliers tried very hard to regain some of the sales it had lost to companies such as Reynolds and Columbus. Peugeot was the worlds largest user of Reynolds 501 Chro-Moly tubing set. This had the effect of making Ateliers lose most of their sales of 181DB tubing. The range was rechristened with names such as TXO, XO, GTI and SM were introduced for road and track use alongside a range for MTB and BMX frames. The top tube set was TXO a chromium-molybdenum-vanadium tube set in 0.8/0.6 gauges with internal ribbing. The same steel, 18 MCDV6, was used to make the triple-butted GTI tube set and the Olympic P/G curved tube set for time-trial frames. 18 MCD6 steel, a chro-moly was used for the XO D/B road and track sets and the 999 NEW P/G touring set. A new type of steel 18MV6 - known as a silicon-maganese tubing SM, was introduced as the company's base set. While some French manufacturers continued to use these excellent sets, the Company did not take much of a slice out of either Columbus' or Reynolds' sales. In about 1993 Atelier de la Rive introduced a superlight tube set called "Prestige", which as I recall was a heat-treated version of the 18 MCDV6 steel but drawn down to about 0.8/0.4 mms. This material did not do much to stem the Company's decline until it stopped production of steel tubing altogether around 1999/2000. Since the late 70s, the company had had a joint venture with Bador and CLB-Angenieux to produce the renowned Duralinox range of frames - frames which were quite revolutionary in their time - and which sold well as long as the likes of Sean Kelly rode and won on them. The last model in that range the 992 actually introduced some 8 or 10 years ago the now ubiquitous "lost headset" design. The company changed owners very rapidly from the mid-90s onwards and was owned at one time by Time and at another by LOOK.. From a height of 196 employees it reduced to around 20. The name is still alive in the ownership of a very strong French cycle industry conglomerate, but now concentrates like everyone else on TIG-welded aluminum alloy frames. They might even be produced in France, but who knows?"